VietNamNet Bridge – "When my name was voiced out, my whole body was shaking. I even burst into tears stepping on the stage and receiving the award." Pham Quang Huy, 11th grade student in central Quang Tri Province recalled his experience in the US more than one week ago. Huy won the third prize of Intel International Science and Engineering Fair (Intel ISEF) 2017 in California for his invention of a robotic prosthetic arm designed for the disabled. His invention competed with more than 1,700 contestants from more than 70 countries all over the world. Earlier this year in March, Huy’s invention was one of five products winning first prize at 2016-2017 national science and technology competition in northern region and was nominated for the international contest in the US. Huy came up with the idea more than three years ago when he was a grade 8 student after watching a TV show about a robotic arm designed for people with disabilities in the US. Huy’s hometown, Quang Tri Province, is home to a lot of disabled people who suffered from war aftermath of bombs and mines or traffic accidents. “I am always willing to design a device that helps improve lives of unlucky people with low income who lost their arm or part of arm,” Huy said about his invention at an affordable cost of nearly VND3 million (US$134). The arm is operated based on a sensor system equipped in the shoe and the joint between the calf and the foot. The movement of four toes which direct four buttons in the toe box will order the bending and stretching of five fingers. The movement sensor helps direct the rotation of the hand and the arm. The robotic arm, according to Huy, uses 3D printing technology for its outer part. Being passionate about designation, Huy learned by himself programming and hardware design from the Internet. He asked for explanation of seniors if there were any difficulties. All electronic components and devices were ordered in Ha Noi and Da Nang. 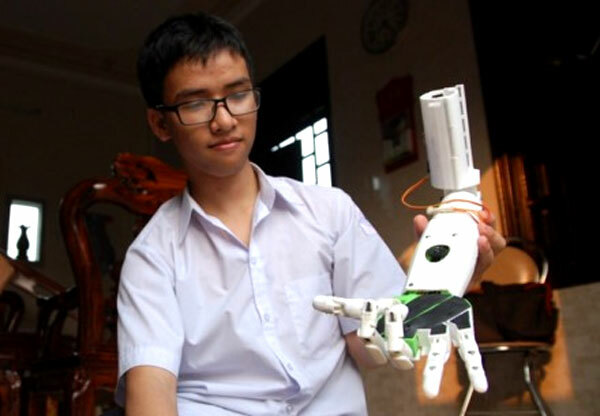 The original version of the robotic arm was finished one year ago with the support of Le Cong Long, a physics teacher at Quang Tri Town’s high school and won prizes of an online competition and provincial level contests. The final product presented in the US has 31 independent movements and made of Polylactic Acid plastic instead of mica plastic like the original one. The arm can hold light objects such as aluminium spoons, water cups, 2-kg weight and carry 11kg objects. According to Associate Professor Nghiem Ngoc Minh, deputy head of Genetic Study Institute under Viet Nam Academy of Social Sciences, head of ISEF judging committee, the robotic arm has been improved and is able to rotate, create 90-degree angle and hold more than 10-kg objects. “Huy tested his invention on the war veterans in his hometown before presenting it to the international competition. This product holds social and humanitarian meanings,” he said. Huy’s passion for scientific invention and designation has been inspired by his father who is only a local motorbike repairman. Pham Xuan Dinh, Huy’s father, said that his son is so passionate that Huy stayed awake through the night for many times to find solutions to his product. For many times, he was worried as his son distracted from study. “I am really proud of his son as the product has a humanitarian meaning and makes contribution to his hometown,” Dinh said. Pham Thi Luyen, 73, Huy’s grandmother said that his room is always full of electronic devices, materials serving his inventions’ experiments. Since Huy was at secondary school, he sneakily asked her money to buy electronic components to design and assemble products. However, before Huy’s trip to the US, the whole family was worried as the talented boy’s visa application was denied twice by US Embassy in Ha Noi. Not until about 12 hours before the flight to the US on May 13, he was granted visa at the very last minutes. Sharing after the triumph, Huy said that he would continue further improve the arm’s weaknesses and share knowledge for those having common passion. “If I have condition, I will operate a system to manufacture the arm in massive number to serve Vietnamese people with disabilities,” he said.